How can something so simple be so incredible? 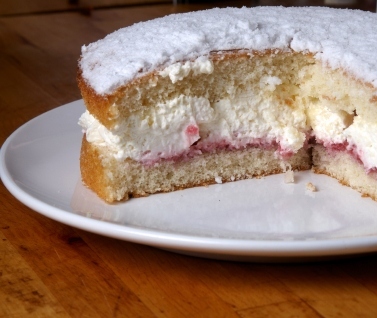 This homemade basic sponge cake recipe from scratch is delightful. Whenever I make it's gone in less than 24 hours. Lovely texture, consistent results, just-right sweetness. Need I say more? Ready to bake a perfect sponge cake? Dorie Greenspan has the best recipe and I'm delivering it to you. Have all of your ingredients sifted, measured and ready to go before you begin to make this cake. PREHEAT oven to 350 degrees. Butter two 9 inch cake pans. Line the bottom of the pans with wax or parchment paper. Put the cake pans on a baking sheet lined with parchment paper or a silicone mat. Sift the flour and cornstarch together. Place the egg whites in a large stainless steel (or heat proof glass) mixing bowl and the yolks in a smaller stainless steel bowl. Place the stainless steel bowl with the egg whites in a pan over boiling water. Add 1 tablespoon of the sugar (of 1/2 cup of sugar), and whisk until eggs are warm to touch. Take off the heat and add the remaining 1/2 cup sugar to the warm egg whites and beat until stiff peaks form. Do the same technique for the egg yolks as you did for the egg whites. Place the bowl over boiling water and whisk in 1 tablespoon of sugar (out of the remaining 1/2 cup sugar. When the yolks are warm to touch, pour the remaining 1/2 cup sugar to the egg yolks and beat with a mixer until thick and light yellow in color. (When you lift the beaters it should resemble a ribbon) Now gently fold this egg yolk mixture and the pure vanilla extract into the egg whites and sugar. Add 1/4 cup of flour mixture at a time and fold carefully until combined. Do not over mix; it will take the air out of the cake batter that you just beat in. Bake for 25 minutes or when a knife inserted in the center of the cake comes out clean. Transfer to a rack and cool for 5 minutes, then run a knife around the sides of the cakes, unmold them and peel off the paper liners. For a homemade lemon sponge cake, just add 1 teaspoon of lemon extract and 1 teaspoon of lemon zest. This basic sponge cake recipe is the bomb, and is an excerpt from the cookbook, "Baking From My Home To Yours" by Dorie Greenspan. She is so good that I wanted to pass this on to you. 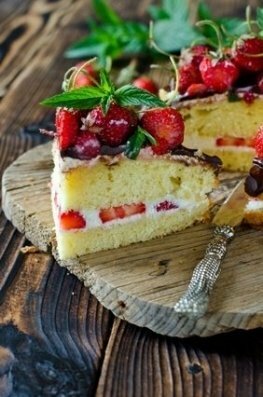 The photo above shows the basic sponge cake cut in half horizontally and filled with whipped cream and freshly sliced strawberries. Topped with homemade chocolate sauce and whole strawberries. She's a beauty isn't she?